I debated whether to review this book or not. I’m still not sure if I’ll leave this post up, or take it down in a few days. The problem with books covering eating disorders is that a lot of readers migrate to them for their triggering effects, to garner the strength to continue their disordered eating patterns. I know; I was there. I lost seven years of my life to it. I know the books well. And readers who are seeking this book to further their illness will find it anyway, with or without my review. This raw, challenging story relates Lia’s struggle with an eating disorder. Her best friend, Cassie, recently died alone in a hotel room, a victim of a ruptured esophagus brought about by bulimia. Both girls suffered from eating disorders, and perversely encouraged the behavior in each other. Now Lia is haunted by Cassie’s ghost, who continues to encourage her in her downward spiral. On the night of her death, Cassie called Lia thirty-three times, but Lia didn’t pick up, and now the guilt is destroying her. Lia starves, fights with her family, stays awake miserably at night, trying to stave off Cassie’s image in her mind. It’s not pretty. 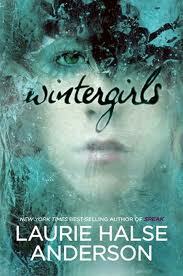 But, with Laurie Halse Anderson’s storytelling prowess, it is skillfully and mesmerizingly told. I’m reviewing the book because I think it’s different from other eating disorder stories, in that she focuses much more on the mental processes involved with anorexia, as opposed to a triggering recitation of calorie counts and weights. While those elements are certainly present in the story, the majority of the text is consumed with Lia’s tortured mental machinations, and readers are transported into the nightmarish territory of her brain. Blank pages, pages of orders that Lia gives herself, such as “Must. Not. Eat” repeated over and over, and her actual thoughts (scratched out in the text, but still legible), followed by what she feels she must think, all combine to create a very realistic portrait of the despair of grief and starvation, without glorifying it. Like I said, I’ve been there. It’s not a pretty place, and Anderson is clear with the message. While I am still ambivalent about the subject matter, because I know it is so often misused by those struggling with similar issues, I am reviewing it because Laurie Halse Anderson is a master storyteller, and this is an excellently written book, that (to me), was careful to avoid exalting the illness. It ain’t pretty, but it rings pretty true. I’d like to close with a quote from another reviewer, Jezebel: “Read without discussion or supervision, Wintergirls could indeed be triggering. But read as part of a conversation — or, perhaps, read by parents and other family members — the book could help make some teens’ worlds a little less dark”. Anderson, Laurie Halse. Wintergirls. Penguin Books: New York, 2009. 278 pp. Grades 10-12. Posted on June 1, 2011 June 1, 2011 by ShannaPosted in ALA Quick Picks for Reluctant Readers, ALA/YALSA Best Fiction for Young Adults, Realistic Fiction, YA LitTagged anxiety, death, depression, eating disorder, family trouble, grief, loss, teen problems.